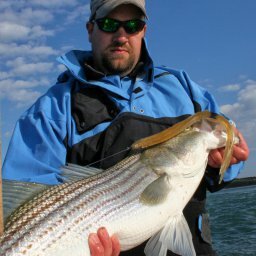 Best Tide: All tides, including slack tide. Slack tide is good because you can cover an area in both directions. 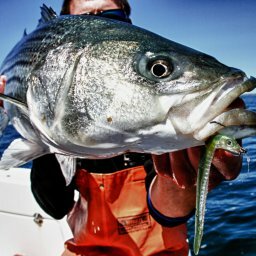 Often the biggest fish are caught during the slack. The tide starts heating up, you are far better off trolling with the current. 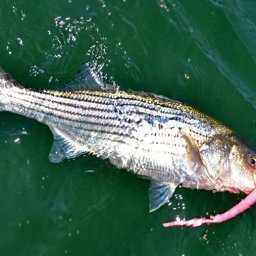 If you try to troll against the tide, you will get what I call the “water-ski” effect and your baits will rise off the bottom from drag against the current. Ideally, your best bet is to start at slack tide and work the first hour. Hazards: Boat traffic, rocks. Please note that the traffic situation is real. 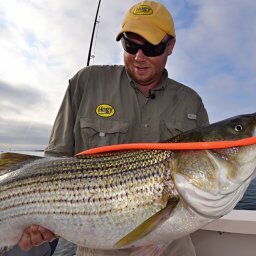 Please only fish in these areas before or after boat traffic starts heating up, especially Woods Hole, where I think the “no-fly” zone is typically from 7:30AM to 6:00PM in season. Quicks and Robinson’s has far less traffic. Approach: I strongly recommend fishing with the tide. 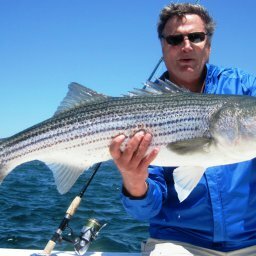 Watch for targets on the fish finder and take the boat out of gear to drop on targets. When this occurs I always drop another 30’ of 40lb braid backing and reel in super quickly. This “drop and flee” maneuver so very often elicits strikes when the fish seemingly have lock jaw. I also jig the bait while trolling, with 2 to 3’ swinging motions. Be ready, the fish often hit it on the drop. As far as where to fish, often the best fishing is right in the channels, so that means a series of short runs. Due to the many short runs, coupled with the holes offering lots of weeds to snag on, I strongly recommend a high gear ratio real for fast pick ups. Bait Selection: I use the 2oz Skirted Hogy Swimming Paddle Jig for a couple of reasons. (1) The paddle tail gives the bait tremendous action on the drop, so you are always fishing. (2) The skirt gives the benefit of extra visibility, vibrations and complex colors. We are fishing in up to thirty feet of water here, so 2oz may seem light. It’s not. I rely heavily on taking the boat out of gear and drop backs to supplement the weight of the lead core. Also, trolling with the tide helps keep the lure down. I find the lighter you can get away with the better. I firmly believe the “fall” of a light jig is so much more natural looking. Colors: Since I am always trolling these areas at sunrise and sunset, I’m never sure to go light or dark, so I typically start with one light color and one dark color. The second filter I use is what they are likely to be eating. If it’s the springtime, I will certainly have a pink color, later in the season with bunker possibly in the area I’ll use the olive and white. Retrieve: Troll at idle speed with the current. The paddle tails will work their magic without any extra effort. 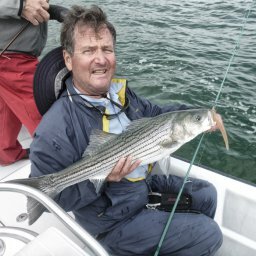 I often see people catch fish with rods in the holders – but trust me- in that hands on interaction with the jiggin’ troll paired drop and reel technique above will up your game by I don’t even know how many double percent! 1) Lighten your leader if you are marking fish you are not catching. 2) Err on the side of snagging bottom. If you are not snagging bottom periodically, you are not in the zone. 3) Always use a loop knot with the skirted jigs. The jig will have much better action. Rod: 5’6” Ultra Light Stand Up 15-30lb class rod from Bass Pro Shops It is light, soft and forgiving. It’s easy to handle and store due to its short length. Reel: Avet LX6. I’ve had set since 2006 and they are still going strong. Unbelievable reels. Lead Core: 150’ of LC-13 Cortland Lead Fly Line: Just about any lead core line will work but my all time favorite is the LC13 from Cortland. It’s hard plastic finish helps the line sink faster than those with braid or Dacron on the outer shell. Lure: Hogy Swimming Paddle Jig in light and dark colors. The bulk of the skirt adds colors and vibrations to augment the soft bait and paddle tail.